Creamy Cole slaw is one of the most common side items served with a BBQ meal. I always have it make an appearance when I cook BBQ, ribs, or smoked chicken. Cole slaw is simple to make, fresh and really sets a nice contrast against smoked pork or beef. Coleslaw is simply shredded or chopped green cabbage, often mixed with shredded red cabbage and carrots for some color. For this recipe, I just purchased a bag of pre-shredded slaw mix. It’s very easy to shred your own if you have cabbage, but I was in a “low prep” mode at the time. Cole slaw dressing is mixed in with the slaw, and that’s where the debate begins. In the South, I most often see a creamy (i.e. mayo) based cole slaw dressing. When I travel to other areas I still see the creamy slaw, but just as often or more see a vinaigrette based dressing. I usually serve a creamy based dressing, as that’s what I grew up eating. In a picnic setting or an outdoor event, I often use a vinaigrette as the heat of a southern summer calls for lighter fare. 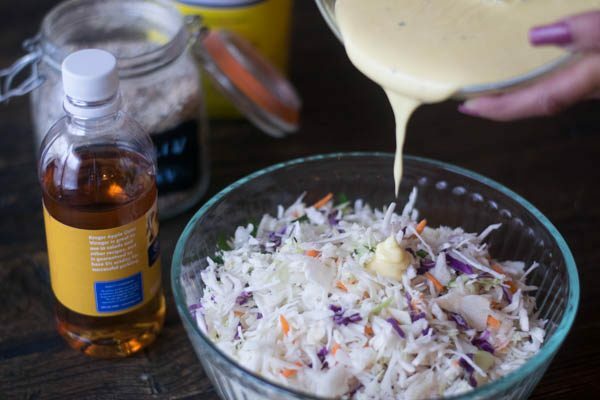 The cole slaw dressing in this recipe is so simple to make- literally just 4 ingredients (counting the grillin’ shake as 1!) If you like it a bit more tart, increase the vinegar or lower the sugar. Make this at least an hour ahead of using it, to allow the flavors to develop. You can then make adjustments if desired. When making slaw, do the same- make ahead. When you put dressing on the shredded cabbage it will “weep” some and make your slaw more “wet” than it appeared to be when first mixed. 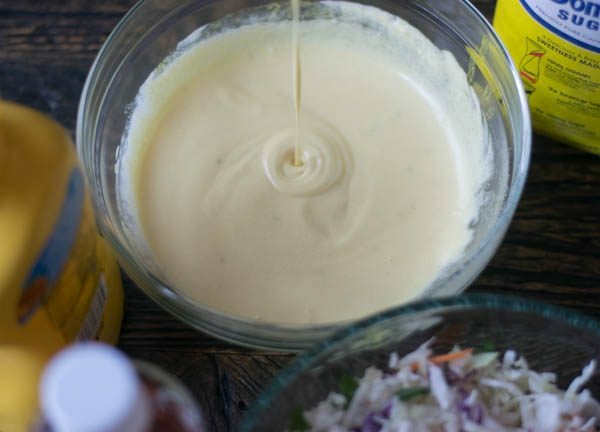 Mix less dressing than you think you need for your slaw, it will be perfect in 30 minutes. Add the mayo, vinegar, sugar and grillin' shake to a bowl and whisk. Taste, and adjust ingredients to your liking. One note, it will get a little sweeter as the sugar disssolves in the mix, so don't go overboard. Add slaw mix to bowl and pour in dressing, a bit at a time. 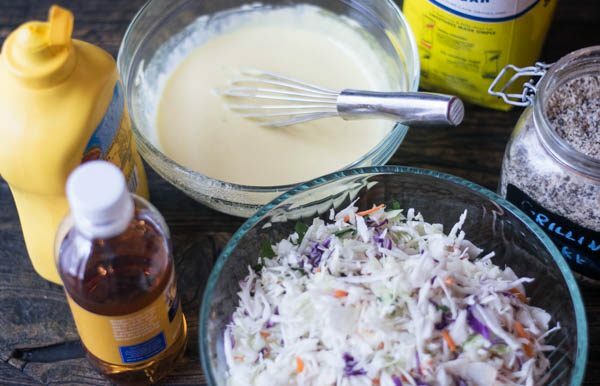 Using tongs, mix the slaw with the dressing until the cabbage is lightly coated with dressing. Refrigerate for 30 minutes. Lightly stir before serving. You’re missing out if you have never used dill pickle juice instead of the vinegar 🙂 It’s a VA thing. Love your website. I just bought my first smoker and was looking for ANY female BBQ role models. So excited to have found your site!